The Pointblank Directive - Doug Grad Literary Agency, Inc. 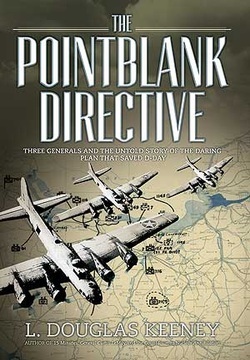 The Pointblank Directive: Three Generals and the Untold Story of the Daring Plan That Saved D-Day by L. Douglas Keeney is a spotlight on WWII’s air war from January 1944 to June 7, 1944, the five crucial months that saw a major change in the air war strategy that enabled Eisenhower to tell the soldiers as he addressed them on the upcoming landings, “When you see a plane over the beaches, it will be ours.” It wasn’t a boast, it was a fact, and how that came to pass is the fascinating story of the operation that was code-named Pointblank. Keeney has ferreted out a story from formerly classified sources (he is an “archive diver” par excellence) including a newly restored manuscript so faded that it has been unreadable for over fifty years, and first person materials never before available to historians; a story that has never been told in this way before. While other books on the Eighth Air Force and the air war over Europe have been published, they encompass the entire scope of the war. And the D-Day landings are usually covered as a Navy, Marine and Army story, not an Army Air Forces story. Pointblank adds new information to the ever-growing history of WWII. More than a story of how it was done, Pointblank is also the story of who did it. Generals Hap Arnold, Tooey Spaatz, and Jimmy Doolittle are all names familiar to WWII readers. But all three men’s lives were intertwined long before WWII. Arnold and Spaatz were pioneers of aviation, with Arnold becoming the second pilot in what was to become the U.S. Air Force, taught to fly by none other that Orville and Wilbur Wright. Spaatz, who had 3 kills in the waning days of WWI, was Arnold’s Executive Officer during that war. And Doolittle, who won just about every air trophy that existed at the time, was the first to take off and land only on instruments. His mentor? None other than Hap Arnold. All three flew aerial exhibitions for the Army in the 1920s on what was essential the military barnstorming circuit. So when things weren’t going well in Europe in 1943 and the planning for the invasion of the continent was advancing, it was imperative that Arnold had in place men he knew and could trust. Arnold fired Gen. Ira Eaker and installed Spaatz and Doolittle to run things from England while he ran things from Washington. It was a brilliant decision, but it was not without dissent and problems. But the three old friends complemented each other and together managed to wipe the skies above Normandy clear of the Luftwaffe to make way for the invasion forces. Keeney has received letters from the Doolittle family and has been granted access to the Arnold family archives, with letters, notes, papers and photographs providing fresh territory for history lovers. Filled with the first person voices of the generals themselves, bomber and fighter pilots who flew the missions, and even the comments of some of the Germans they went up against, Pointblank will be a fascinating window into a story we all think we know, but which will appear new once more. L. Douglas Keeney has been writing military non-fiction for many years and is a well-known researcher among archivists where formerly classified documents repose. He has been published by St. Martin's Press, HarperCollins, Simon & Schuster, William Morrow and MBI as the author, co-author, or ghostwriter of numerous books. He has been reviewed by Newsweek, salon.com, The New Yorker, and The New York Times. Keeney has appeared on The Discovery Channel, CBS, The Learning Channel and The Military Channel and has been interviewed by scores of radio stations and syndicates. He is presently the on-air host for On Target. Keeney has a BA in Economics from the University of Southern California and an MBA from the University of Southern California’s Marshall School of Business. In addition to writing, Mr. Keeney worked for fifteen years in marketing and advertising in Los Angeles and New York with Young & Rubicam and Ogilvy & Mather, and internationally with a subsidiary of British-American Tobacco. He was nominated to the Institute for Advanced Advertising Studies (NYC) and was nominated for Entrepreneur of the Year by both the Graduate School of Business at the University of Southern California.